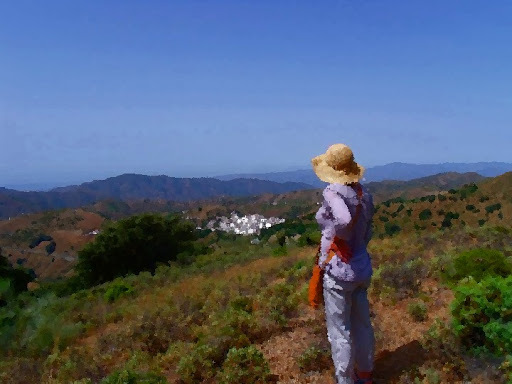 Me, in the Andalucian mountains – almost, but not quite, alone. I don’t mean an hour here, an hour there, still clutching smartphone and wandering through streets filled with busy strangers. I mean alone – totally. Cut off from contact with anyone. I got to thinking about this recently after a conversation with a friend, and found myself mentally working back to the last time I was genuinely isolated. I recalled many times when I spent hours of each day alone – I still do – and other times when I felt particularly lonely, but none of these periods was isolation. Then I found it. May 1987. I’d moved into a new apartment and took a week off work to decorate. A landline hadn’t been installed, there were no mobile phones, no email, no internet. I didn’t even have a TV or radio. I had a record player and a pile of albums. I also had a busy social life and a large circle of friends, but for whatever reason I chose to be alone that week and paint those walls. I eventually ran out of paint and had to pop out to buy more and it was the first time in five days I’d spoken out loud and heard another person’s voice… if you discount song lyrics. That’s twenty six years ago. The last time I was completely alone is TWENTY SIX years ago..! I think of it now – spending five days without another human voice, without any form of contact, real or virtual – and I wonder whether I could do it? The concept both intrigues and horrifies me. What do you think? Could you be totally alone for a period of time? There’s a place – the Anechoic Room – which, if you listen to the recording, is self-explanatory. A scary thought. Total silence. Apparently, nobody lasts longer than 45 mins. I'm an introvert. A loner. I loooove being alone. I like being alone with just my spouse as well. Spending time with people saps my energy and makes me cranky. We're an odd breed, we loners. I am alone, quite quite quite alone, a lot. Mainly I enjoy it. Occasionally I feel the weight of the air. Yes, but is it *really* alone – as in sans gadgets? Every time I revisit this post, I crave my dad’s Spanish mountains.